Our pal Caldwell, a frequent Facebooker, recently posted to Kat “We were in Big Bend last year, and nothing’s alive there, except tourists.” Aside from Facebook (I long ago decided that I would use it only if someone paid me to, and they haven’t) we know nothing of Big Bend. The internet helps, but the National Park Service site could just as well be an ad for Club Med. 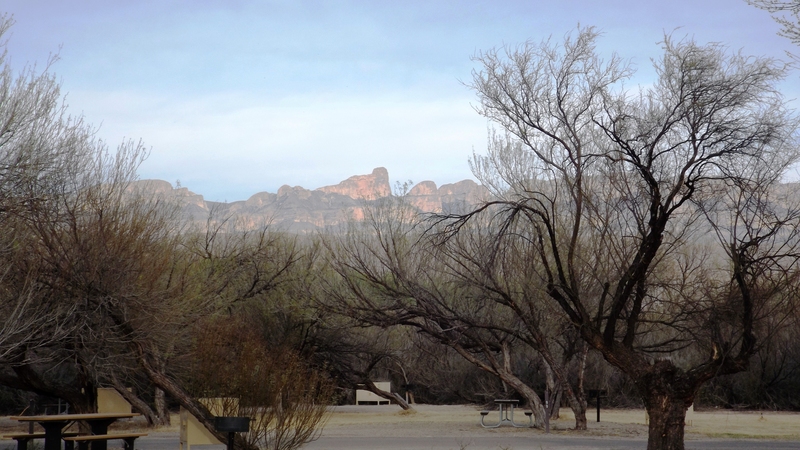 But we have been there, and I am here to tell you There Is All Kinds of Life in Big Bend. Well, there’s no night life, but you see where this is going. 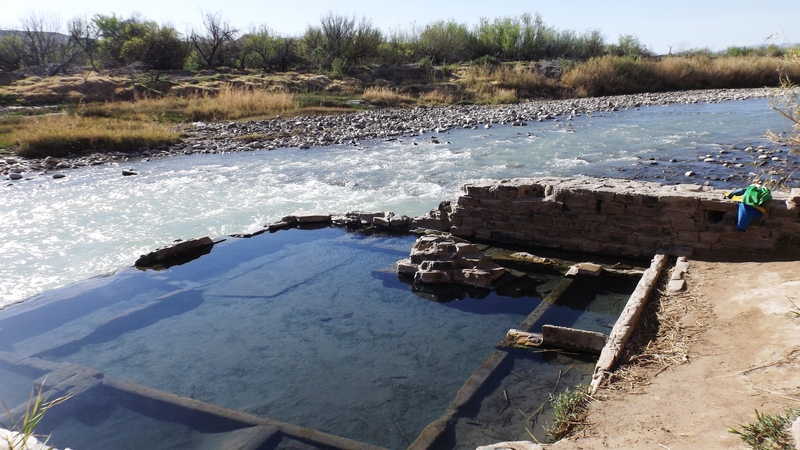 Abandoned Hot Springs Resort … Too Shallow To Get Naked In … Which Is Why They Went Broke. 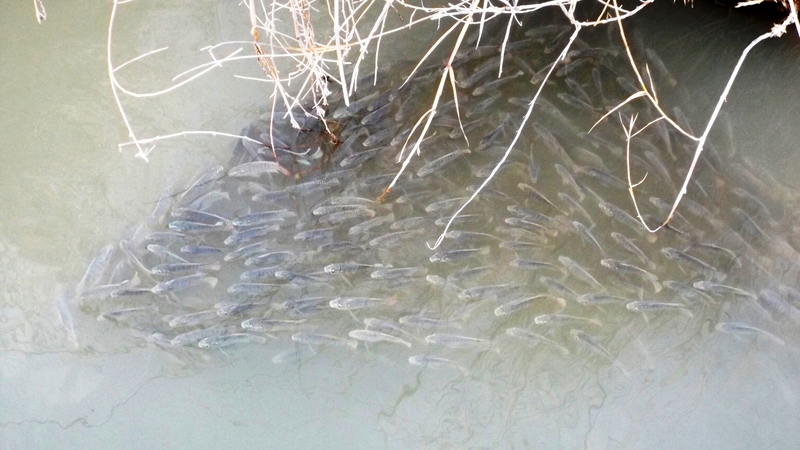 Big Bend Fish: Tilapia? Main Ingredient in Fish Tacos. We’ve seen four kinds of butterflies, three varieties of housefly (none bite; they’re more interested in sweat), several jackrabbits, and lots of birds. Seconds ago I spotted a hummingbird of an unknown species (they move so fast) whom apparently was drawn by the color of the Red Sled. We’re going to get a hummer feeder and try to bribe them to hang around this summer. And yesterday I spotted a pair of Vermillion Flycatchers, which are a new addition to our lifetime bird list. A clean identification of a new species is always exciting, and these are very handsome birds to boot. Plus we saw all kinds of ducks on and over the Rio Grande’s swamp while hiking the nearby Nature Trail. Mexican nationals are alive and well in Big Bend. There are dozens of places in the park where you will find unattended kiosks (what’s the Spanish word for ‘kiosk’, uh, como se dice ‘kiosk’?) 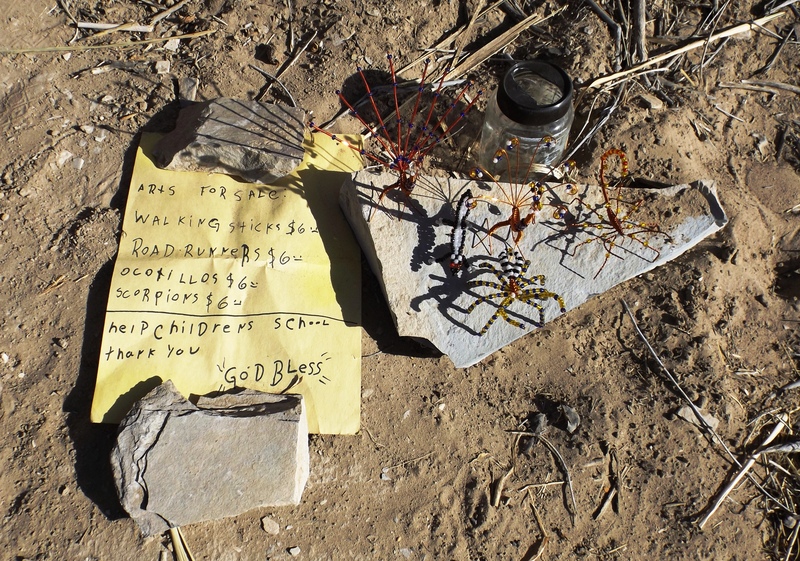 offering walking sticks, copper, steel, and bead ‘sckorpions’ or roadrunners with a money jar. There is of course a menu of prices, and I found it interesting to note that the walking sticks cost exactly one third of what an identical stick sells for in the Park Service store. Rumors say the store buys the sticks from the same guys, and then marks them up three or four times. Of course the Park puts great emphasis on La Ley’s criminal penalties of possessing stuff illegally imported from across the river. Where is NAFTA when you need it? Why was it passed, if we can’t get Mexican stuff on the cheap from someplace other than Wal-Mart? 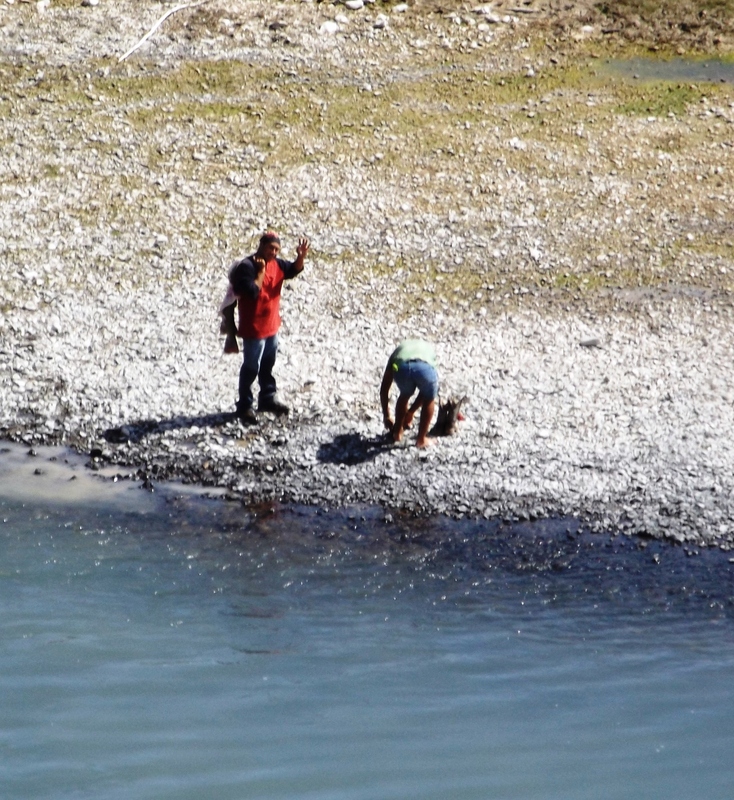 From the Other Side of the Rio Grande comes “Hola”. Kat replied “Aloha.” The humor of her retort was lost on that fellow. 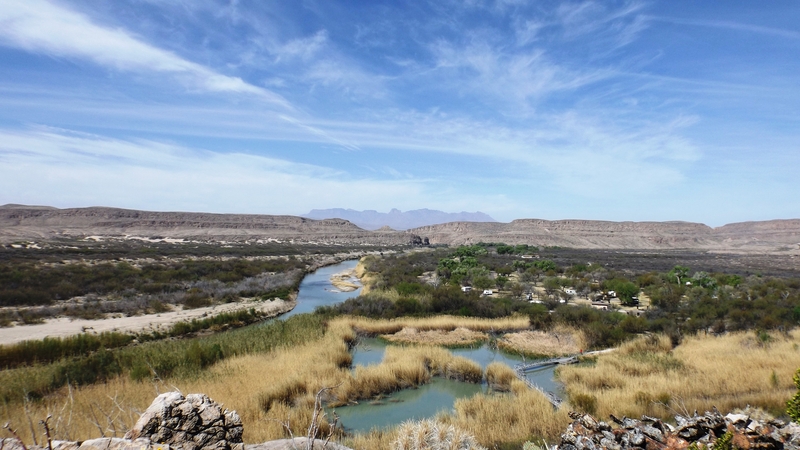 Kat took some primo pictures of the Sierra del Carmen mountains on the Mexican side of the river. The tallest one, on the left, is known as El Pico. Or in Tex-Mex, ‘El Peako”. There are supposed to be great sunset colors on those mountain walls, but so far, no dice. View From Our Campsite, Facing East. That Tallest One Is El Pico.